If you are looking for crystal flowers, these red rose favors will surely impress your guests. Love and beauty are represented in these petite glass rose favors. 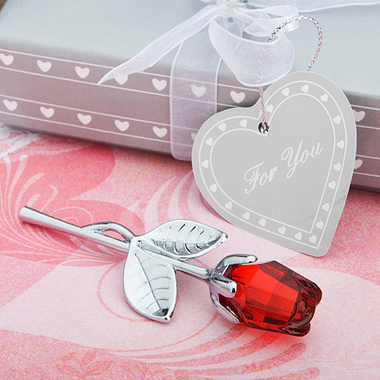 Measuring 3.5 x 1 1/8 inches, each rose favor features a glistening, multifaceted red crystal glass rose bloom atop a chrome finish silver metal stem with outstretched leaves. A red letter choice for weddings, showers and more, each crystal red rose favor makes for a stunning presentation nestled in white satin inside a Choice Crystal signature two piece silver box with a heart design, wrapped with a white organza and satin bow with a crystal heart accent on top and an attached silver heart shaped ?Thank You? tag. You may also purchase personalized hang tags or stickers for $.35 each. If you select the hang tags they come pre-punched with a round hole and include a 5" long white elastic string (not attached). You have your choice of tag/sticker shape - Diamond (1.75" x 1.75") or Round (1.75" diameter), background color and design.